WG 121b possible bug ? It is NOT enriched ? 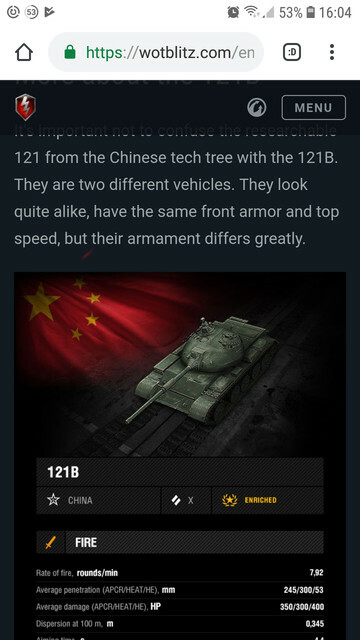 Hi the 121b is meant to be an enriched not premium tank. However the credit co efficient is 90% which is not an enriched co efficient. Can WG confirm it's mean to be enriched and that the tanks in game co efficient is working correctly? Edited by ballist1x, 09 February 2019 - 04:50 PM. It is when compared with the other tier 10 meds, with credit coefficients of between 80-85%. The 121b is not being enriched. I'd expect at least 40-50% enrichment which would put it on par with the enriched mk6 chieftain. Edited by ballist1x, 09 February 2019 - 05:57 PM. Will be interesting to see what they say to your ticket! Something is just not right about the way the tank is being sold or it's credit co efficient is incoherent in game. Edited by ballist1x, 09 February 2019 - 11:14 PM. Yep, I got it and since 21st of December and was surprised as you are. I get used to it, but TBH it feels like we get screwed and you can't even make it enriched what is soooo damn funny. Because you get a (kind of) Premium tank which brings you... no money. The only argument why I didn't write to WG is I actually like this tank and had no time to do this. But it should be enriched some way. Only if many.people start to bring this to WG attention.might they fix it. Edited by ballist1x, 12 February 2019 - 10:44 PM. 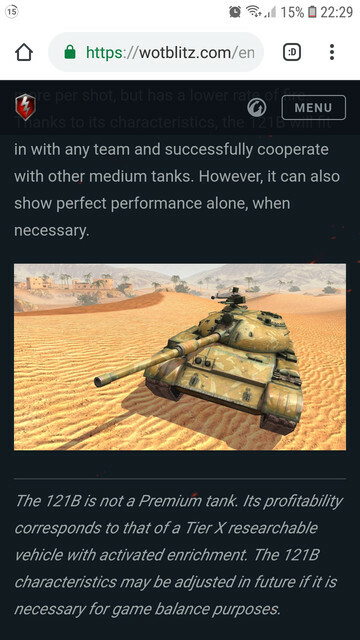 Good lad, no matter what anyone's opinions on T10 premium/enriched tanks is, whoever bought the 121b is not seeing the permanent enrichment status being applied to this tank. The data shows that compared to every other T10 or T9 Enriched tank, the 121b is an anomaly earning 35%-50% less credits than its eers , except the 'M60' which WG footnoted as not having enhanced credit earnings. 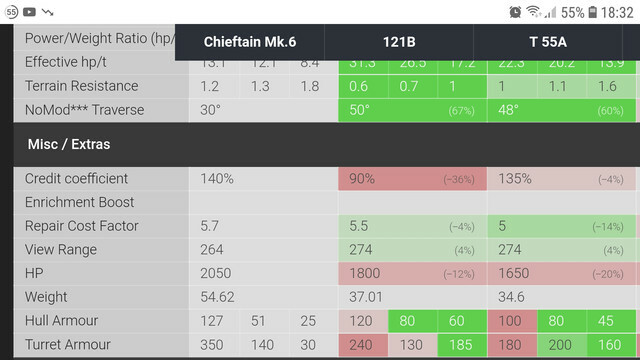 You can go to blitzstars and do a vehicle compare between the 121b and every other T9 or T10 Enriched tank and see the data for yourselves. Edited by ballist1x, 13 February 2019 - 07:58 AM. Good lad, whatever anyone's opinions on T10 premium/enriched tanks is whoever bought the 121b is not seeing the permanent enrichment status being applied to this tank. I have PM'd ribblestripe and reached out to Meadsy69, Sk8xtrm, and bushka to see if they can put in a question to WG also. Justice for the Commando 121B!! I just ask one thing, would you let me know the outcome if any tickets raised so we can see how WG respond and whether we get any different responses? Well I got an answer from WG, basically the tank is not enriched and won't be by the sounds of it for balance reasons. As suspected, option c, gits, typical thieving WG. Edited by Mjr_Eazy, 14 February 2019 - 02:59 PM. How do you balance a tank, on it's credit earning when all the other similarly enriched tanks earn loads more ? WG are certainly never going to get any more money from me.